My recent experience with Rolex demonstrates the values of their company and why some brands are worth their premium price. 03:59 – How does your brand measure up? Hey, James Schramko here, and today I want to share with you what we can learn from Rolex about marketing and positioning. So you’re probably wondering, James, where’s your Rolex? Well, the good news is I still own it, and the second part of that is it’s actually in for a service. I’ve had this Rolex for about 10 years. Now, firstly, they could have done a better job of following me up. They have not followed me up since the day I purchased it, considering the watch is worth somewhere around $12,000 to $15,000. They should have had a CRM program. But in any case, it was time for service. Now with Rolex, it reminded me very much like the Mercedes-Benz experience. So I’m going to step you through what happened and the main lessons from this. The first thing is, I looked up where to get it serviced and I found very prominently the official Rolex service center. I also phoned them up and the lady answered the phone and her name was Louella. She gave me very clear instructions to where I could service it. When I arrived at the building in the city, it was a very large prominent building and the Rolex repair center is actually on the top floor or near the top floor of the building. So it’s in a premium position in a premium marketplace. So everything reflected the Rolex brand values. When I arrived at reception, I pushed on the buzzer, Louella let me in, and just like a concierge at a hotel, we had a discussion about the watch. She actually grabbed my watch and said, “Hello darling, welcome to Rolex and we’re going to look after you.” I guessed she felt she had some kind of a relationship with my watch. Made me feel like they’re going to look after it. Now by this stage, I felt like this was going to be an expensive repair because it’s a premium building, the premium level in the building, a premium brand, everything sounds and looks expensive so far. Louella gave me this first letter, which outlines the job number, the payment methods, and what will happen next. She said that I will actually be contacted the next day and that I will get a quote, and then I can decide to proceed. It also suggested how the payment would be made and also that I would need photo ID for collection. So if you’re thinking about picking up my watch forget it. That’s in my name. Anyway, the next day, the phone rings and it’s Louella. She says, “Mr. Schramko, I’ve just sent you through your quotation.” And I got the quotation. By now I was expecting this is going to cost thousands because my expectations had been built up through this whole process. Louella said she would send me the quote, and then phone to follow up, and she did. So the important lesson here is explain to people what’s going to happen and then do it. When I got the quote I was actually delighted that it was substantially less than what I thought it would cost. In fact, will be around $1,292 if I replaced the sapphire crystal, which they recommend. I actually feel after 10 years, then that’s not actually too much. The watch will probably look like brand new and I should get another 5 to 10 years from it. By the way, if you are one of those people who says, “Oh, I could get a cheap watch for $10 or $15,” I think you’re missing the brand values of Rolex. And I would advise you to have a look at the way you feel about money, and make sure you separate money from value. So just to wrap things up, Rolex delivered on their brand promise. Everything was top-shelf premium. It was delivered as promised. I feel special about the watch. I know it’s going to be brand new when I get it in 12 weeks. I do have another watch that I can wear in the meantime, but since I’m surfing every day at the moment, I’m just not going to bother. I’m going to look forward to that special moment when I pick up my watch. Anyway, I hope you’ve liked this little story about marketing and how Rolex can teach you something about your brand. The action step is to go and have a look at how you’re marketing and positioning your brand and see if you have a good process in place, and see if you actually deliver on that and see if your customers feel like they’re actually getting great value for money even if you have premium pricing. I’m James Schramko, catch you again soon. 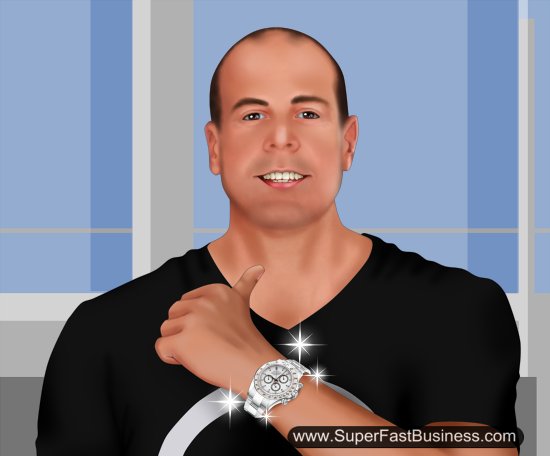 Level up your business with more tips from SuperFastBusiness. James, you nailed it with this story.Branding is it. period. That is precisely why we are moving to our new premium level brand. These shorter videos are nicely Impactful, its given me some great ideas. I would love to see the heat map on vistia to see what percentages make it to the end .. Maybe an idea for an episode..for you on that subject alone. This is a great post! I had a similar experience at the Lexus dealer…. brought my car in and was treated so well, and the environment was so beautiful, I was dreading the bill, and it was so minor I couldn’t believe it. Important to think about all the ways we’re in touch, and the way we further our brand and loyalty or disrupt it.